At any given time, OPAL researchers are likely to be found at sea, at science symposia about the globe, or in the classroom. Research facilities include chemical and biological analyses laboratories, with emphasis placed on bio-optics, trace metals, and carbonate chemistry. 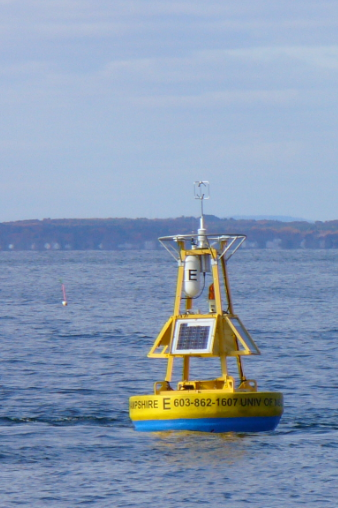 Field work is ongoing in the Gulf of Maine, and OPAL maintains several operational buoys as well as a decade-long shipbased ecosystem sampling program using the UNH R/V Gulf Challenger. Numerical modeling activities include several computing clusters and work with both oceanic and atmospheric models as well as CFD. The Northeast Consortium was created in 1999 to encourage and fund effective, equal partnerships among commercial fishermen, scientists, and other stakeholders to engage in collaborative research and monitoring projects in the Gulf of Maine and Georges Bank. The Coastal Carbon Group (CCG) is an interdisciplinary research team within UNH-EOS engaged in efforts to observe and model how the Earth's pool of carbon moves between the land, ocean, and atmosphere - with a particular focus on how this carbon cycling occurs in coastal regions such as our own Gulf of Maine. Ocean remote sensing is a core OPAL activity with investigators working on data collected by numerous ocean observing satellites. We serve on NASA and ESA earth observing science teams and our work spans research in the areas of air-sea interaction, ocean color, and bio-optical, chemical, and physical oceanography. Coupled bio-physical systems and how the coastal ocean circulation and mixing impacts biology serve as one focus for the research of Dr. Jamie Pringle who maintains a computing cluster dedicated to numerical simulations using a range of circulation models and approaches. The chemistry of trace metals and nutrients in the coastal environment is the focus of the Environmental Geochemistry Lab. The lab is equipped with a trace metal clean room as well as a wet lab for nutrient analysis. The chemical and physical processes occurring in the sediments are a major research focus for Dr. Linda Kalnejais and the lab is also equipped with sediment sampling and erosion chamber devices. Work with NOAA's Integrate Ocean Observng System efforts in the last decade resulted in the formation of two new research centers of excellence at UNH and led by OPAL scientists. Activities from these centers are now being merged into the Northeast Regional Coastal Ocean Observing System (NERACOOS) and the Ocean Acidification program office at NOAA. The Coastal Ocean Observing Center (COOA) developed and implemented a system for monitoring the linked oceanic and estuarine ecosystem in the western Gulf of Maine region. This monitoring system was designed to detect changes in the ecosystem across multiple physical and trophic levels. The mission of the NOAA-UNH Joint Center for Ocean Observing Technology was to advance the nation's capability for coastal ocean observing by developing and demonstrating new technology and the innovative use of existing technology.